The U.S. Bureau of Economic Analysis released preliminary State GDP figures for 2013 along with comprehensive revisions for data from 1997-2012, following the major National Income and Product Account revisions at the national level a year ago or so. What follows are our office’s quick, high level look at State GDP growth. 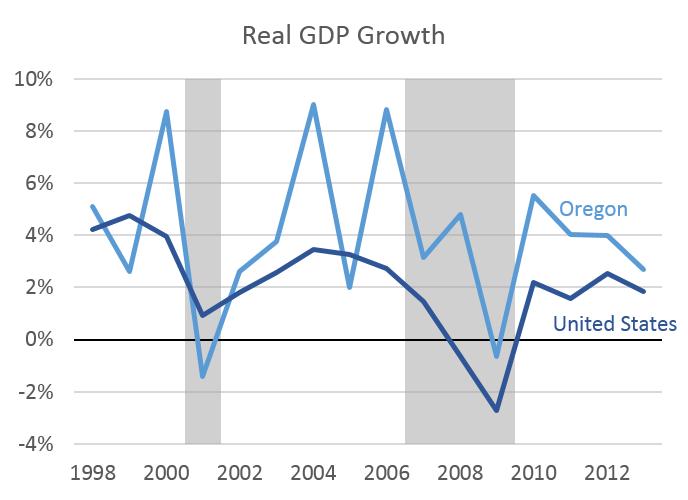 First, here are what the revisions did to Oregon’s nominal GDP (see correction note at end). 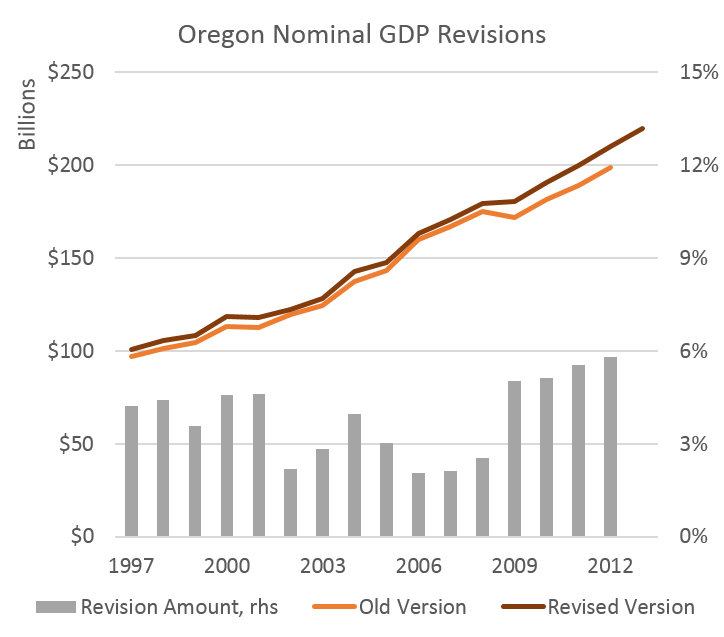 Over the 1997-2012 period, the revisions added, on average, 3.9 percent to Oregon’s total nominal GDP. In recent years, from 2009 to 2012, the revisions have been larger at 5.4 percent on average. The primary reason for this — most likely — is what BEA has done with the revisions. Nationally, and now locally, BEA has started including items such as R&D expenditures and Intellectual Property Products as components of GDP. These categories, R&D in particular, are quite large here in Oregon given our very productive, and expanding high-technology firms. Specifically, BEA cites the following in their press release. While the revisions adjusted the level of GDP across the country, it really didn’t alter the pattern or rate of growth very much. In 2013, overall growth slowed across the country with the average state growing 1.8 percent in 2013, following 2.5 percent growth in 2012. The median state slowed as well, albeit not very much, from 1.9 percent to 1.8 percent. Oregon likewise followed this trends, with growth slowing from 4.0 percent in 2012 to 2.7 percent in 2013. Oregon is still growing faster than the average or median state, however our growth advantage slowed last year. 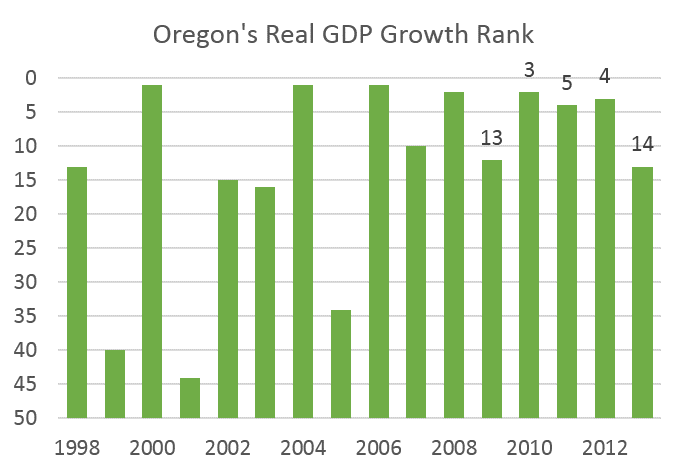 Over the past 15 years or so, Oregon’s state GDP typically grows 1-2 percentage points faster than the nation and the latest figures are largely consistent with this. 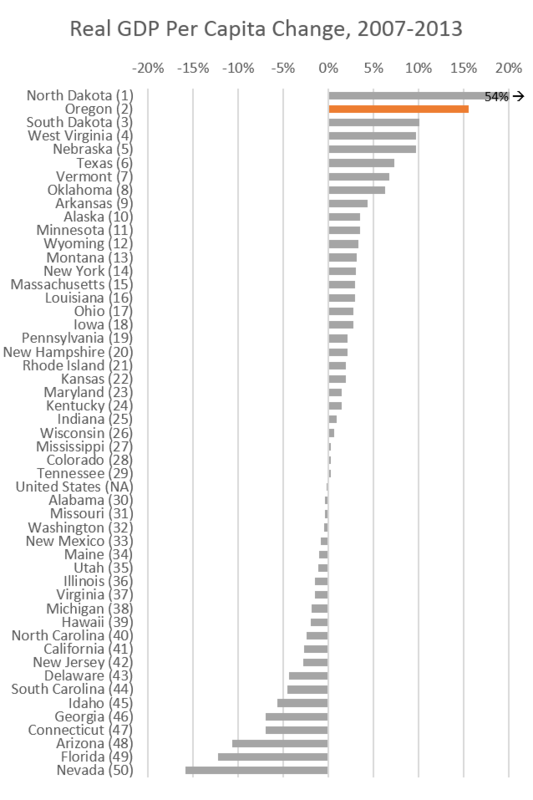 Oregon’s growth ranking, realtive to the other states, is 14th for 2013. This is down from the Top 5 rankings the state experienced in recent years, however it is not out of the historical pattern during expansions. 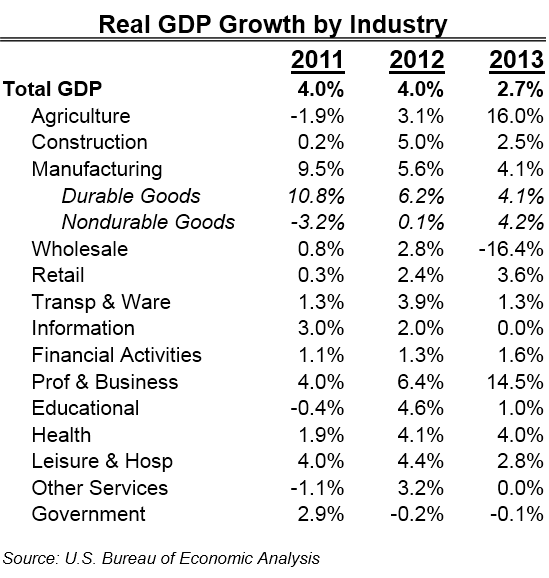 The following table shows the growth rates in recent years by industry in Oregon. Much of our state GDP growth comes from our very productive manfuacturing sector — high-tech in particular — and as the growth rates within that sector have slowed, so too has the statewide total. It should be pointed out that slowing was expected given that it is not every year at a massive, capital-intensive expansion takes place, such as the recent (and on-going) Intel expansion. Lastly, in terms of per capita real GDP changes since the start of the Great Recession, Oregon trails only North Dakota. For more on why Oregon does well on state GDP, please see our previous posts on Historical Economic Performance and Manufacturing Employment and Output. Correction: Original post had incorrectly calculated the Oregon revision amount. It had originally stated 8.3 percent for real GDP, however this also included a benchmark year change from 2005 to 2009, which had not been properly accounted for. The corrected figure of 3.4 percent for nominal GDP is more accurate and stated above.